How easy it is to pinpoint the bad managers in our lives. A driver knows who they are. These managers are the ones who make coming to in to work more of an act of drudgery than anything else. While a bad manager in any industry makes work tough, it’s a slightly different story in the transportation industry. 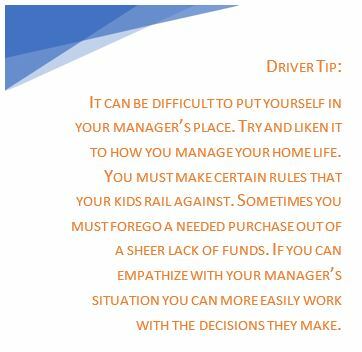 A bad manager can create safety issues for the driver and others sharing the road. Let’s look at how to develop a strong driver-manager relationship that proves mutually beneficial. Communication is vital. If the driver and manager are not able to speak freely with one another there will always exist a rift. And rifts breed distrust. Distrust breeds discontent. Managers need to provide feedback, both positive and constructive. But it does not end there. A manager must also be open to both types of feedback. After all, the driver is the one hitting the road and doing the work. Their input is vital to the success of any company. While not everything a driver suggests can be acted upon, it should, nonetheless, be given a fair hearing. That means a manager must put aside their ego and listen openly. there is an increased possibility your driver will simply call off from work rather than deal with the frustration. And word will get around. No one will want that route. That is not a good situation for the customers! Attitudes focused on retention will lead to driver longevity. It’s true, there are many of openings for a trucker job out there, but how many drivers are available to fill those openings? A manager who has the attitude of, “don’t let the door hit you on the way out” is detrimental. It’s true that one might be able to find another driver in short order, but will they be the kind of driver you want to employ? Will they hold true to your company ethics? Will they leave your customers satisfied? If you have a driver who has concerns and they are vocalizing those concerns, don’t dismiss them out of hand. The concerns could be legitimate. If a recruiter dismisses them their company could be losing out on the opportunity to make their fleet a better place to work, and harder to focus on driver retention in the long-term. Training is expensive and having a high turnaround is a lose-lose situation. Consistency is another important point to consider. If you, as the manager, are playing favorites to some drivers over others, it will not go unnoticed, no matter how covert you attempt to be. If your goal is to breed longevity and contentment, then you must forego favoritism. Your rules must be clear and universally applied. There is an adage of, “the squeaky wheel gets the grease.” Well, that’s not necessarily a good thing. If you have one or two drivers you simply give in to because you can’t stand listening to them whine, then your hard-working drivers who give you their all every day are going to start ramping down their efforts. You end up with some drivers who will always be complainers, and then a whole slew of drivers who stop caring about how they do their job and just go in each day to earn a paycheck. That will lead to definite customer dissatisfaction, which impacts company profits. Another key to having a good driver-manager relationship is attitude. The right attitude can foster long-term working relationships. Attitude is a two-way street, however. Not only do drivers need to have a good working attitude, but managers must have a good attitude towards their staff. No driver wants a truck driving job where they won’t be appreciated, or worse yet, will be denigrated on a regular basis. a driver? What changes have they seen in the industry over the years? What keeps them behind the wheel? When you, as a manager, have a good attitude toward your drivers, when you can show through your actions and words that you care, your drivers will want to show up for work. They will want to give you their very best very day. Drivers: Put yourself in your manager’s shoes. What type of struggles do they face? Do you understand the pressures they have from their management? Can you imagine the budgetary restraints they face? If you can try and put your manager’s place and try and understand why they have to make some of the decisions they do, it may be easier to work with them. Why is all of this so important? Why does it matter if managers and drivers work together? After all, shouldn’t an employee just keep quiet and do what they are told? Many call tell you from personal experience that this is easier said than done. It’s all well and good to tell a driver to just do their job, but if they do not understand why, how can they truly do the job well? It’s true that it’s technically none of the driver’s concern why management makes the decisions they do, there is something to be said for sharing the thought behind the decision-making process. When employees understand the “why,” they are more likely to just do the work without complaining. When a driver’s safety is paramount in the mind of a driving manager, then safety will be paramount in your driver’s mind. This mutual understanding makes the roads safer for all types of motorists. A manager is not necessarily the one dispatching loads. However, a manager can intervene on behalf of the driver and work with dispatch to make certain all loads are routed safely. A dispatcher has incredible pressure to get loads to/from locations in strict time limits with minimal amount of money spent. That causes too many dispatchers to bend the rules on drive time, work hours, and resets. This can be especially true if a dispatcher has no previous driving experience. A manager can step in and appropriately educate the dispatcher on safety measures that must occur. At the end of the day driver’s need to want to come to work. How that happens is when they work somewhere they want to be, where they feel needed, and more importantly, where they feel valued. A valued employee will give you 100% of themselves, always. Whether a driver bumps docks, or walks product down a ramp off the back of the truck/trailer, they are interacting with a customer base. It takes little time for a customer to pick up on a driver’s discontent. If most of the drivers a customer deals with are unhappy, or angry, or belligerent, it will affect their decision to continue doing business with a company when it comes to contract renewal time. It is not in your best interest to have drivers who hate their trucking job. How you keep a driver from hating their job is to make the environment conducive to two-way feedback. Are you familiar with the open-door policy? It’s not a literal open door. It is the concept that you, as a manager, are willing to hear when an employee has a matter they are upset about, angry about, happy about, what have you. And this brings up one other point, when a driver feels free to provide feedback, it will not always be negative. When there is true communication between driver and manager then when things are being done well, a driver will feel more inclined to share that as well. If you have a driver who enjoys coming to work, a dispatcher who knows how to route loads safely, and a manager who is leading with compassion, you have the Triple Crown of a great company! Never be afraid to employee the techniques needed to maintain a happy and safe place to work. Your drivers will notice and appreciate your efforts. And at the end of the day, a happy driver equals a happy customer!